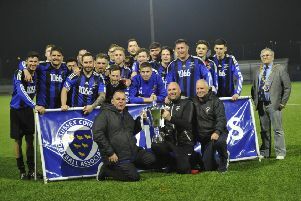 Little Common Football Club will be gunning for a place in the quarter-finals of its divisional cup competition tonight (Tuesday). The Commoners will make the long journey to Storrington for a rearranged Macron Store Southern Combination League Division One Challenge Cup second round tie. Kick-off is 7.15pm. Common will travel west buoyed by winning their last five matches in all competitions, the latest of which was a terrific 5-0 victory away to Steyning Town in the league on Saturday. Those results have helped Russell Eldridge’s side open up a 10-point lead at the top of the table having won 22 of their 26 league matches to date. Two of those victories came against Storrington, who although in the bottom half of the standings, will be on a high following a 2-1 victory away to an in-form Bexhill United at the weekend. As far as the league’s concerned, Common have won more matches than anybody else, possess the best goal difference, are the highest scorers and have the meanest defence. At stake for the winners is a home quarter-final against Selsey, with Langney Wanderers awaiting further down the line in the semi-finals. Bexhill are through to the last four in the other half of the draw and will play St Francis Rangers or Oakwood.